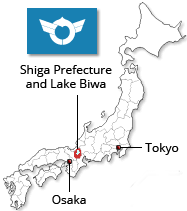 Shiga Prefecture (滋賀県) is part of the Kansai Region and borders the prefectures of Fukui, Gifu, Mie and Kyōto. Shiga is one of the eight landlocked prefectures of Japan and takes the form of a basin surrounded by mountains on all sides. Lake Biwa (琵琶湖 Biwa-ko), in central Shiga, is the largest lake in Japan. The climate is moderate with heavy snowfall in the northern half. Known as Ōmi Province (近江国 Ōmi no kuni) or Gōshū (江州) after the Taika Reform (645/46), the area was crucial from early on. The city of Ōtsu (大津市), the modern capital of Shiga Prefecture, served briefly as the imperial capital in the seventh century. Various warlords, such as the Hōjō, Azai, and the Ishida clans gained dominance through the feudal period, and its proximity to the capital of Kyōto made it the site of several major battles in Japanese history. In the late sixteenth century, Oda Nobunaga, the national unifier, established his base at Azuchi Castle near the eastern shore of Lake Biwa. The magnificent edifice was destroyed shortly after Nobunaga’s death in 1582. After Ishida Mitsunari (石田三成, 1559-1600), the daimyō of Ōmi and opponent of Tokugawa Ieyasu in the Battle of Sekigahara, was defeated, Ieyasu bestowed the area onto some of his closest retainers, the most prominent of which was the Ii clan, who established Hikone Castle close to the ruins of Sawayama Castle (佐和山城 Sawayama-jō). The merchants of Ōmi were noted for their entrepreneurial skills during the Edo period (1600-1868). Shiga was an important commercial centre, with numerous stations along the Tōkaidō and the Nakasendo roads connecting Edo and Kyōto. After the Meiji Restoration Ōmi was split up into eight prefectures which were merged into Shiga Prefecture in 1872. The region of Reinan (嶺南) was incorporated into Fukui Prefecture in 1881. While neighbouring Kyōto seems to put the region around Lake Biwa in the shade, Shiga Prefecture offers an array of exciting destinations to tourists. Travellers from Tōkyō will most likely arrive at JR Maibara Sta. (米原駅) on the Tōkaidō Shinkansen (about 2 hours and minutes, 12,260 JPY), while there are plenty of options for travellers from Ōsaka (about 40 minutes on the Tokaido-Sanyo Line, 950 JPY) and Kyōto (11 minutes, 190 JPY) will arrive at the southern town of Ōtsu (大津市). Lake Biwa: Japan’s largest freshwater lake has a picturesque northern shore and an island called Chikubu (竹生島 Chikubu-Shima), designated a “Place of Scenic Beauty”. Cruises around the lake can be booked in Ōtsu. Omatsuzaki is one of the “Eight Views of Ōmi” around the southern shore (近江八景 Ōmi Hakkei) with its clear water and white beaches. Chikubu Island can be reached by boat from Nagahama Port (2,980 JPY for the round trip) and Imazu Port (2,520 yen), admission to the island is 400 JPY. Hikone (彦根): the town has preserved the touch and feel of the Edo period. Hikone Castle was built by Ii Naokatsu between 1603 and 1622 and is one of the few authentic Japanese castles that have survived to this day and is only one of four designated as a National Treasure. The view from the central keep onto Lake Biwa is spectacular; Hikone Castle Museum, Yume Kyobashi Castle Road, a shopping street recreating a streetscape of the Edo period. Nagahama (長浜): renamed by Toyotomi Hideyoshi Nagahama, who erected a castle there, Nagahama is a small town with a few attractions, such as Nagahama Castle, a ferroconcrete reconstruction of the original donjon built in 1983, the oldest train station in Japan still in use, and the Keiunkan Guest House (慶雲館) constructed in 1887. Enryakuji Temple (延暦寺): founded in the early Heian period, Enryaku Temple is a Tendai monastery, and the headquarter of the Tendai sect located on Mount Hiei (比叡山 Hiei-zan) in Ōtsu. The temple complex is part of the UNESCO World Heritage Site “Historic Monuments of Ancient Kyoto (Kyoto, Uji and Otsu Cities)”. Mount Hiei is situated at the border of the Shiga and Kyōto prefectures and can be reached from the Kyōto side by Eizan Cablecar and ropeway (15-20 minutes, 840 JPY, 1640 JPY for the round trip) or from the Shiga by Sakamoto Cablecar (11 minutes, 840 JPY, 1570 JPY for the round trip). The Tendai sect wielded significant political and military power, fighting other Buddhist sects and expanding their land until Oda Nobunaga declared war on them and obliterated the vast temple complex. The current buildings were reconstructed at the beginning of the Edo period (1600-1868). Ōtsu (大津市), the capital of Shiga Prefecture: imperial capital in the seventh century, the city offers an abundance of temples and shrines, such as the Ōmi Jingu Shrine (近江神宮), Ishiyama-dera Temple (石山寺), Mii-dera Temple (三井寺, also known as Onjoji Temple), Hiyoshi Taisha Shrine, Saikyoji Temple (西教寺), Takebe Taisha Shrine (建部大社); hot springs, such as the Ogoto onsen; also cruises on Lake Biwa start from Ōtsu port. Ōmihachiman (近江八幡市): picturesque merchant town developed from the days of Toyotomi Hideyoshi; William Merrell Vories established the first commercial English school there in 1906; Himure Hachiman-gu Shrine, Hachiman-bori Canal, Mount Hachiman (can be accessed by taking the Hachimanyama Ropeway, 八幡山ロープウェー). Miho Museum: designed by I.M. Pei, the Miho Museum is located in rural Shiga, an area famous for its Shigaraki pottery, and displays a collection of artwork belonging to Koyama Mihoko and her daughter, founders of the Shinki Shumekai sect. The museum exhibits Japanese art and antiquities from all over the world. It can be reached by JR Ishimaya Sta. on the JR Biwako Line and by taking a Teisan bus, leaving every ten minutes past the hour between 09:10 and 13:10 (50 minutes from JR Ishiyama Sta, 800 JPY). Azuchi (延暦寺): the ruins of Azuchi Castle; constructed by Oda Nobunaga, Azuchi was a splendid castle with a donjon and was burned down in the Honnouji Incident; Azuchi Castle Donjon, Nobunaga Museum: the original-scale replica of the 5th and 6th floors of the Azuchi Castle donjon was displayed at Seville Expo ’92. Replica of the top three floors of Azuchi Castle's main keep.